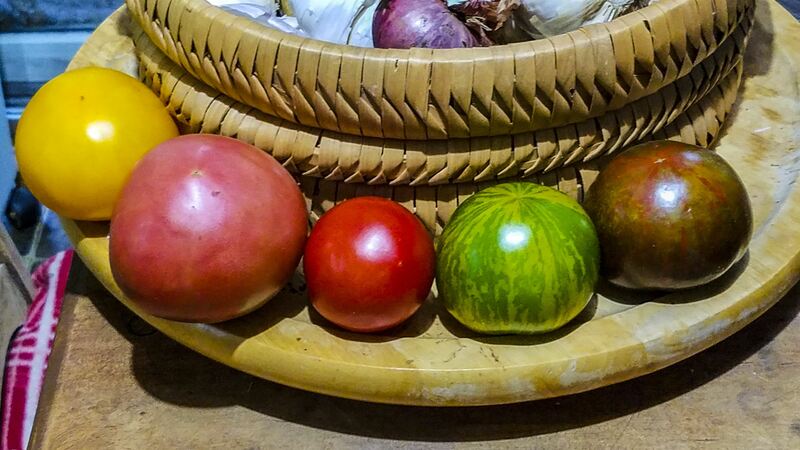 Mix and match your tomatoes. Use your favorites. Green striped are tangy. Brandywine are full of flavor. Black tomatoes have less acid. And cherry tomatoes and plumb tomatoes are tangy and flavorful. When it’s summer, you can play with this for weeks. 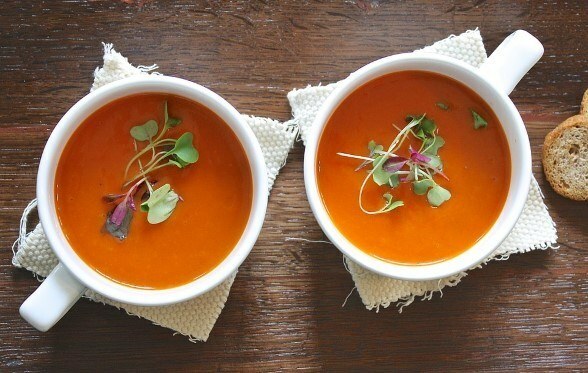 Using white, or green, or yellow, or orange tomatoes always makes the color of your soup interesting. Chop up a few things, remove any blemishes from the tomatoes and the area around the stem. Add them all to your NutriBullet (or to a blender with a very “high” setting . . . some call it “extracting”). The bulk of the tomatoes will not allow you to put all these ingredients in at the same time, so once your blender or NutriBullet is full, run it to blend up the ingredients to make room for the rest. It’s best to peel the carrot. Yes, we know that there’s a lot of nutrition in the outer edge, but it’s also bitter. I have the NutriBullet Rx (which actually cooks the soup) so I place the canister on top of the engine and let her rip. The first time it slows down is when you can press the Green button for a few seconds till it turns red. Then go answer your email; in about ten minutes it’s done and boy is it good. If you can’t cook it in your NutriBullet or you’re using a blender, just warm it up on the stove.